For over two-hundred years, Trebbo di Reno, 6 km from Castel Maggiore near Bologna, celebrates a festival dedicated to the ''Raviola'', a traditional biscuit filled with ''mostarda bolognese" (a local jam). 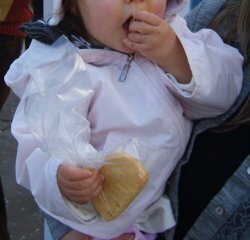 The tradition comes from the locals, that used to prepare and eat this sweet dough on St. Joseph's day (also Father's Day), March 19. This 209th edition of the festival includes, as usual, lots of concerts, performances, exhibitions, markets and food stands. On Sunday, at 2.30pm, starts the classic allegorical floats parade. This ancient festival used to close, since 1600, the religious celebration called "Solenni Quarantore" (the Solemn Forty-hours), after the high mass, the procession and the blessing of the town. In past times it was also one of the moment of the year in which the Trebbo's emigrants used to come back and visit the relatives. The feast was lighten up by carousels, acrobats and sellers of any kind that attracted people also from the near villages. Trebbo di Reno, located close to the right riverside of the Reno, is easily reacheable from Bologna, getting out from Porta Lame. The Reno river left its trace along the history of the town, in particular regarding the church. In fact, the chiesa di San Giovanni Battista had a troubled existence, starting from its original structure having been swept away in a flood. Over the years it underwent numerous rebuilding works, so much as in 1887 the belltower was shifted by four metres since it was leaning dangerously.